Four Roses Bourbon is marking its 125th anniversary with a year-long series of events, contests and competitions. The Four Roses story dates to its founding in 1888, and includes milestones such as Prohibition, two World Wars, a 40-year exile from the U.S., and its purchase by Japan’s Kirin Brewing Company and return to the States. As part of its anniversary celebration, Four Roses created a cocktail competition in conjunction with the Starz Network series, Magic City. Members of 19 chapters of the United States Bartenders’ Guild (USBG) were invited to participate in the first round of the competition by submitting a recipe that used a Four Roses Bourbon: Yellow Label, Single Barrel or Small Batch. Round two featured ten semi-finalist events, where competitors were judged on presentation, usage of all cocktail ingredients and balance with Four Roses Bourbon, taste, and skills. Eveleigh’s own Kiowa Bryan (pictured above) emerged as the winner of the regional semi-finals at The Spare Room. She will represent Southern California in the finals of the Four Roses Bourbon Magic City Cocktail Competition, competing against nine others on June 9 and 10 at the Four Roses Distillery in Lawrenceburg, Kentucky. 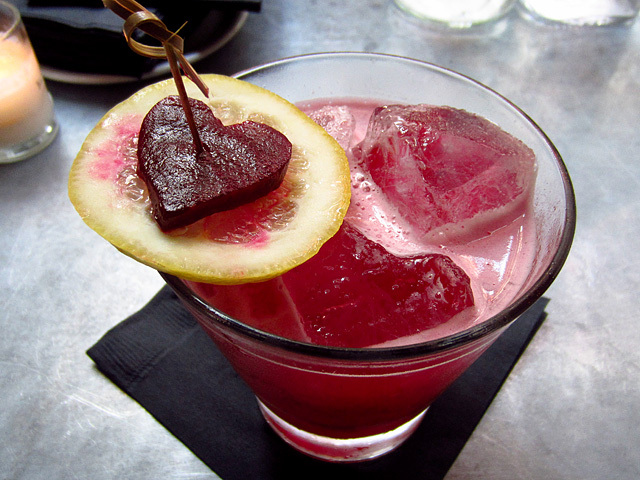 Her recipe for the Kentucky Beet Down follows, after the jump. Four Roses is also marking its anniversary with the launch of its Year of the Toast website, where fans can read toasting suggestions and submit an original toast for a chance to be featured on the Four Roses Limited Edition Single Barrel release in 2014. The winning toast and its creator’s name will be featured on the bottle. History buffs will enjoy browsing the gallery of Four Roses artifacts, which includes the earliest Four Roses bottle (dated 1919), a Prohibition-era liquor “prescription”, vintage recipe books and more. Fans can also follow @4RosesBourbon on Twitter and toast with the hashtag, #125toast. I was invited to sample Kiowa Bryan’s Four Roses cocktail at Eveleigh before she flew to Kentucky and vie for the Magic City competition’s $5,000 grand prize. 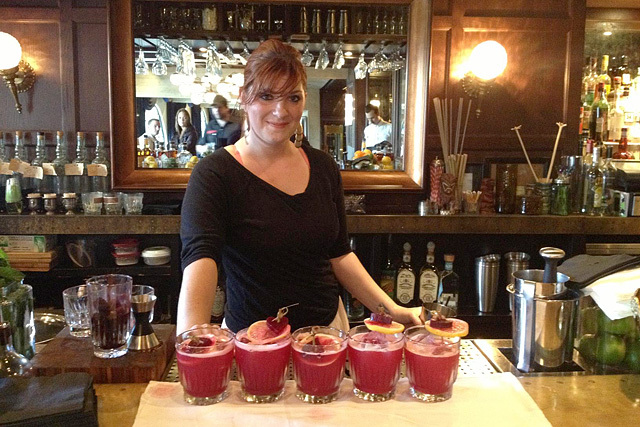 When asked about the inspiration for her cocktail, she said that she loves beets, and featured an earlier version of the Kentucky Beet Down on one of her Farmer’s Market Sunday menus at Eveleigh. Riffing on Sam Ross’ modern classic, the Penicillin, Bryan weaves a balanced and nuanced mix that highlights the subtle Four Roses Small Batch, with just the right amount of ginger bite. For all of the Magic City cocktail recipes, visit fourrosesmagiccity.com/drink-recipes. Shake and double strain over ice. Garnish with skewered beet and candied ginger. *Roasted beets: place beets in roasting pan with 2 vanilla beans, drizzle with olive oil and water, sprinkle with sea salt. Cover with foil and roast for about an hour at 400 degrees.